GMERS medical college has a well-equipped library having more than 9500 books covering all the broad specialities and superspecialities. 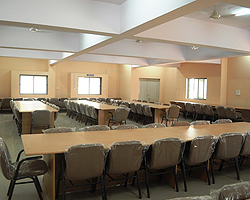 Audio-visual facilities like OHP and Slide Projector - TV/V.C.R./CD texts are available at Central Library. The Library is open from 09:00 AM to 6:00 P.M and the Reading room is open from 8 A.M to Midnight. We are also having facility of E-Library .We have 40 computers with internet facility in central library for the students and faculty. The library has access to vast full-text electronic resources. To keep the faculty and students aware of recent advances in treatment and research, the library subscribes to around 100 national and International Journals.